A friend of a friend had pointed out the existence of trendy Brunswick Street, lined with numerous boutiques and cafes and that sounded like a lovely way to pass the early afternoon. We walked north along the street – here’s a tip, just keep going! The first part of the street doesn’t look at all promising but I assure you that many shops will show up. We popped into a Vietnamese grocer and inquired as to a Vietnamese restaurant nearby and he told us to go to Viet Rose, further up the road. When we got here, the place was just starting to fill up with the lunch crowd and so we happily took a table by the window. 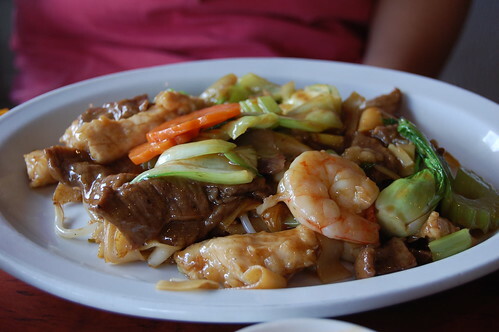 The lunch menu had many good value dishes – rice, fried noodles, cold noodles, soup noodles were all covered. I ordered the spring rolls on rice vermicelli and a Vietnamese iced coffee while my friend chose the mixed meat fried noodles and a side order of summer rolls. Not five minutes after our ordering, the server was back but with a plate of mixed meat fried rice. We sent it back, pointing again at the menu where mixed meat fried noodles was listed. All our orders did come correctly soon after but we then saw the same server try to give a similar (maybe it was the same?) plate of fried rice to the ladies sitting next to us….well…that was weird. Were they trying to get rid of a plate of unwanted fried rice? Double check your order if you visit! 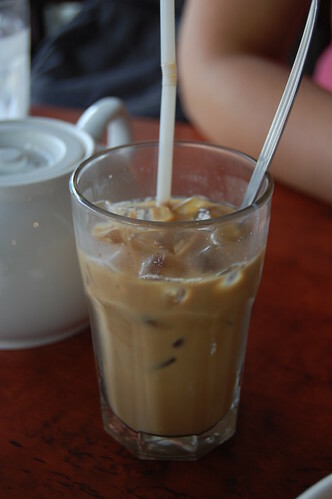 My Vietnamese coffee was exceptionally sweet and I had to wait until a lot of the ice had melted before I could drink the syrupy joe. 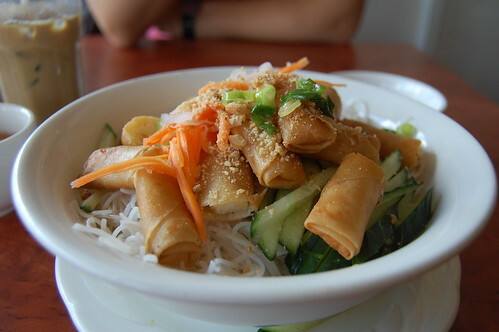 The spring rolls on top of my noodles were totally different from any other Vietnamese rolls I’ve had. They were tiny little rolls filled with a pure prawn paste – very delicious and quite unique. 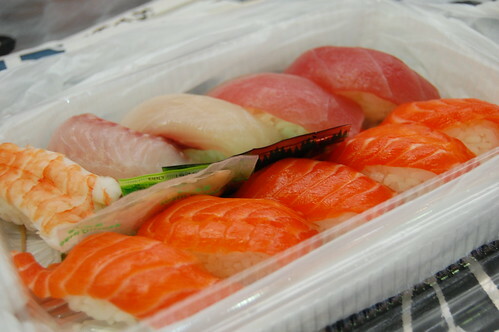 Pork, chicken or vegetables are other filling options. I was told that my friend’s noodles were also delicious but her summer rolls were mostly wrapping and not enough filling. We walked out stuffed and pretty happy overall. But again, remember what you ordered and don’t accept anything else! My second and last day in Sydney was spent mostly lazing around – I really just wanted to live like a local. And what do the locals do? They have barbecues, of course! Wow, they really do live up to their barbecuing stereotypes and I was treated to an impromptu barbie that night. 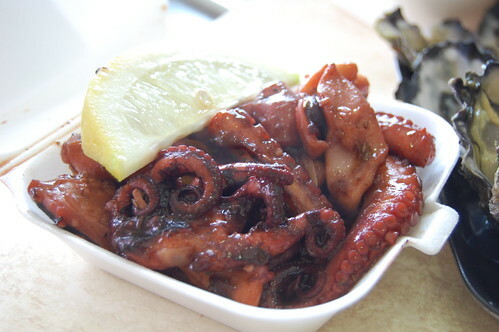 We made a trip that afternoon to Paddy’s Market and Chinatown to pick up potatoes, beef steaks, lamb chops and baby octopus. 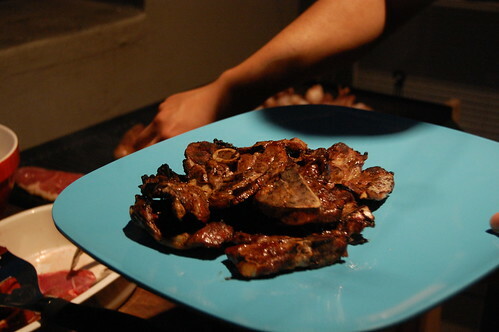 The potatoes were boiled for potato salad, the beef and lamb were rubbed with olive oil, and the baby octopus was marinated in chopped garlic and sweet chili sauce. 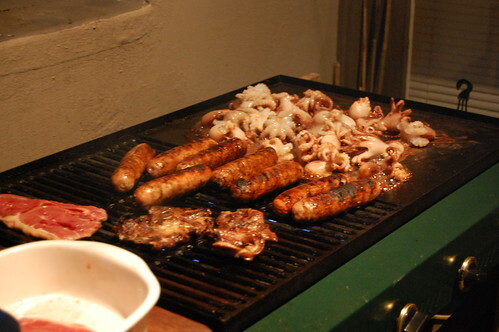 That night, the barbie was fired up (gas) and on went the steaks, chops, octopus and even some pork sausages too. (And no, we did not throw shrimp on the barbie that night!) Oh, the smell that came off that grill was spectacular! What a terrific, and meaty, dinner that was! You now how they say “Aus-trah-lian” in the Fosters ads? They don’t say that in Australia – they say “Aus-tray-an”. Or at least, I’ve heard people in both Sydney and Melbourne say that. When I arrived at the Sydney Fish Market, my first thoughts were, “I didn’t expect it to look like this!” I expected it to look more like a wholesale fish market but what I saw instead was a building filled with stalls selling both raw and cooked fish, ready to be cooked and eaten on the spot or taken home. There was plenty of both indoor and outdoor seating and I could see groups of people at each table huddled over vast spreads of seafood. 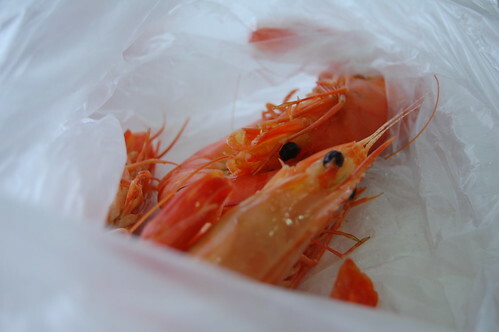 Lots of people were also looking for tables while carrying huge platters of both raw and fried seafood. Oh yeah! We grabbed a table and this is what we managed to consume. 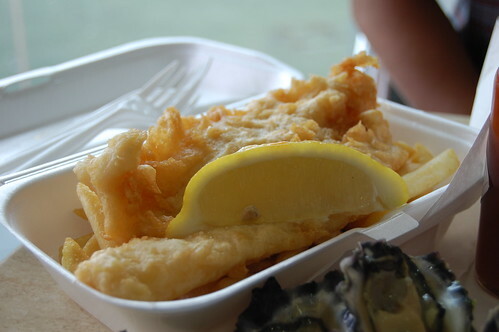 Everything was just so so fresh and most of the seafood was fished from Australian waters. Go! 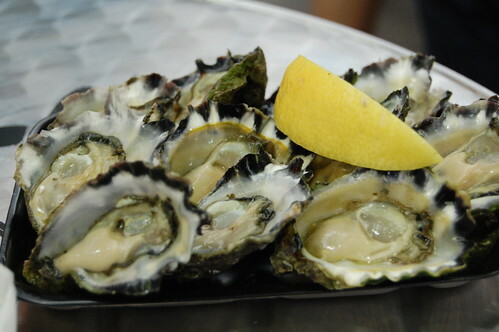 I’d say this market is a must if you like seafood – visit if you’re in Sydney! After Brisbane, I took a Virgin Blue flight to Sydney. The weather couldn’t have been more different – from hot and sticky in Brisbane to chilly and wet in Sydney. Oh well, lucky for me the weather cleared up by the second day. I was taken to Toby’s for my first breakfast in Sydney. Their coffee was very delicious and actually, I just wanted to share this art I encountered on top of my flat white (Australian term for a coffee and milk combo similar to a latte)! 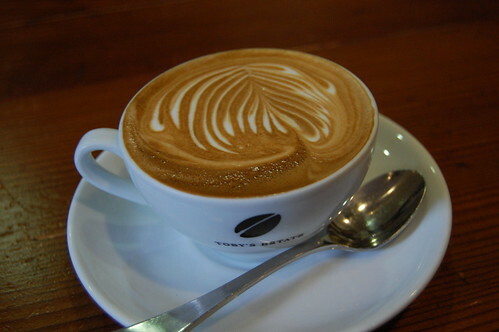 They also serve some nice sandwiches and baked goods but their coffee is the thing to have. On our last night in Brisbane, for some bizarre reason, all of us (me and colleagues) wanted steak. Perhaps this was due to all the cold sandwiches and salads we were fed at the conference? One colleague went off to the Hilton to ask the concierge to recommend a place and Jade Buddha was a name that he brought back. So off we went! First impressions of Jade Buddha were that it was loud and that it looked hip. My impressions were spot on – it’s the only place I’ve been to that has a coin-operated hair straightener in the ladies’ bathroom! Most of the women sported ironed hair and short skirts and they flicked their eyes up and down on you as you walked to your table. It definitely wasn’t my kind of place. 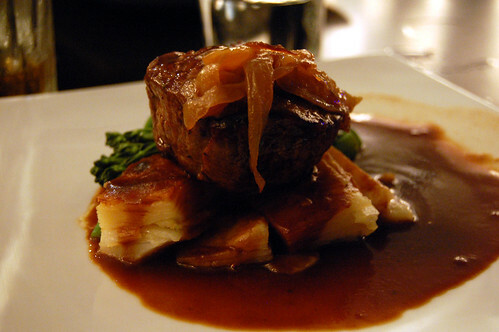 Almost all of us ordered the eye fillet with potato gratin, myself included. Hey, remember we wanted steak! Steaks were cooked exactly as we ordered them and the sauce it came with was quite nice – brown butter based, I think. It was all quite nice but nothing special; it was just well cooked. The steaks also came with a small side of broccolini and I ate that like it was going out of fashion (off a friend’s plate too…heh…maybe I needed my vegetables). Desserts were very weak. We ordered a fried ice cream (ice cream in a coconut batter crust), a chocolate Buddha (gooey choc pudding) and a sticky date pudding to share and I found them all to be both overly rich and much too sweet. Looks like this restaurant is mainly a place to be seen – once again, not my kind of place. After a particularly long work day, I just wanted my bed but my colleagues were up for some food first. After a bit of fruitless walking about the South Bank, we spied this busy restaurant. We just managed to get a table for the five of us. While we knew that a busy restaurant was more of a guarantee of good food available, we had forgotten that it also meant a long wait for our orders! Oh well. 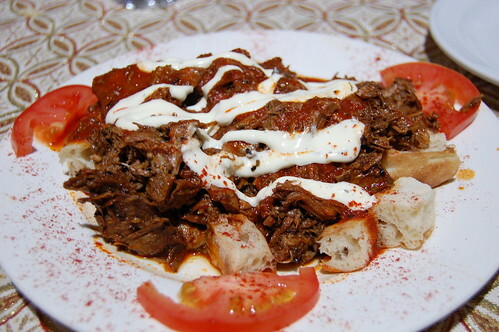 I ordered the lamb iskender, shredded lamb pieces in a tomato sauce over pieces of bread, with yogurt and their “special sauce” drizzled on top. The lamb pieces were very tender though there was a piece of mysterious, flabby, white thingy I found that I couldn’t identify within the stew. Hmm. The bread underneath was delicious, having soaked up all the lamby, tomatoey juices from the stew, and was somewhere between chewy and soft; there wasn’t enough of it though! The meat to bread ratio was unnaturally high and more bread was definitely needed. You know, I did feel better after a bit of food in me! Sorry for the lack of posts – work’s been hectic and on top of that, mild jet-lag has been causing me to fall asleep relatively early each day. As one would expect when travelling, I ate at a lot of restaurants – you’ll probably see a lot of little reviews of the dishes that I managed to get through. Posts are also going to be in chronological order because I’m like that. We arrived in Brisbane in the early morning and so our hotel room wasn’t ready for us. We dumped our bags and went wandering around to kill some time: registering for our conference, went up and down the river on a ferry, and eating! My first full meal in Australia (after a much needed coffee) was at a little Vietnamese cafe on the South Bank. 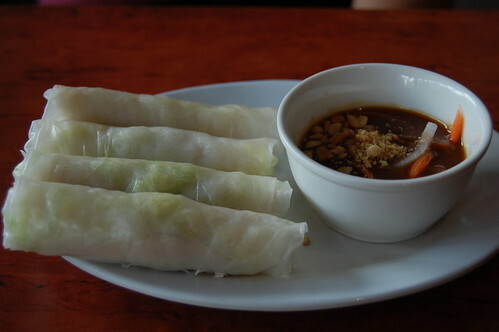 Viet De Lites is a modern looking place but with very traditional Vietnamese meals on the menu. The lunch specials consisted of a one course meal (something on noodles or rice) and a drink. 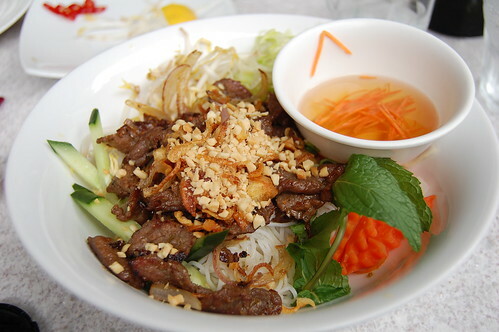 I chose this grilled lemongrass beef on rice vermicelli and I think I had lemonade to drink. This has to be the fanciest presentation I’ve ever had with this dish! Cold rice vermicelli sits at the bottom and warm grilled lemongrass marinated beef and beansprouts, lettuce, cucumber, chopped peanuts and Vietnamese pickled carrots and daikon are strewn on top. This all sounds quite dry, no? What enlivens this entire salady bowl is that little bowlful of nuoc cham, the Vietnamese dipping sauce. There’s fish sauce, chili, and sugar in there and it’s probably diluted with a little water too. I pour this over the top, mix mix mix, and chow down. Very refreshing for a hot and sunny day.